Many thanks to Caroline Palmer, granddaughter of Edward and Winifred Varwell for the photographs and most of the information on this page. Thanks also to Sue Coney and Joyce Cole for additional information. When Mr Hawkins Blake Varwell, of Thornworthy, Chagford, died at the end of 1928 he left an estate valued at £61,103 net. His property was left in trust for his wife for life, and after various bequests the remainder was left in equal shares to his three children, including Edward Heron Varwell. The funeral of Mr Varwell had taken place at Brixham, the 'home of the family' according to the Exeter and Plymouth Gazette, as the family had lived there for generations. On December 20th 1933 Emma Mortimer Varwell, widow of Mr Hawkins Blake Varwell, died on the eve of her 83rd birthday. In the December quarter of 1910 Edward H Varwell married Winifred J Vinen in the St George Hanover Square registration district. The 1911 census shows the Varwells living at Crossways, Exton near Topsham. Edward's occupation is that of a coal factor, and he was born in Exeter. Winifred was born in Highbury. 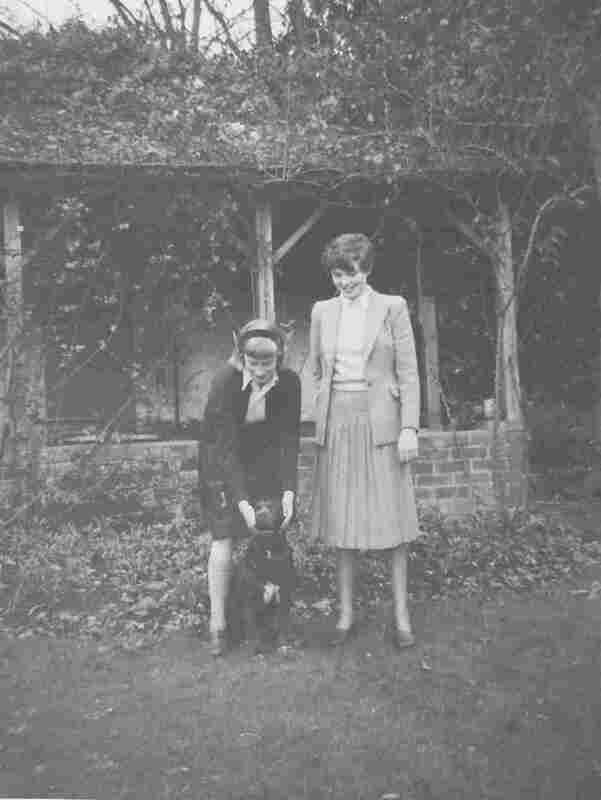 From Caroline Palmer: Edward Heron Varwell and Winifred Janet Varwell (nee Vinen) owned and lived at Place Ashburton from approximately 1930 – 1963. Both Edward and his wife Winifred are buried in St Andrew's Churchyard, Ashburton. Edward Heron Varwell survived 4 years of WW1 in France and then Salonika. He was awarded the DSO. militaryarchive.co.uk, the DSO and VC volume, has the following information about Edward. Born on the 18th September 1879*, he was the son of Hawkins B. Varwell, of Chagford, Devon. He served in the European War, 1914-1918, was mentioned in Dispatches and was created a Companion of the Distinguished Service Order for distinguished service in the field. A Major in the Wessex Divisional Signal Company, Royal Engineers, Territorial Force he married, in 1910, Winifred Janet, daughter of George S.Vinen. London Gazette, 23 June, 1915. *An announcement in the Exeter Flying Post confirms that a son was born to the wife of Mr H B Varwell on September 18th. The Varwell's address at the time was 3, Sydney Place, Alphington Road. Edward's medal index card shows that he entered France on December 21st 1914, and was entitled to the British War Medal, the Victory Medal and the Star Medal. A note says: D C Signals no 1 area Devonport forwards from roll of individuals entitled to the Emblem 27 2/20. The Emblem usually (?) refers to being mentioned in dispatches, which seems to be confirmed by M.I.D. being shown on another index card. He was awarded the DSO in June 1915. A member of the Wessex Divisional Signal Company, the Western Times stated that he had been a member of the R E Territorial Force for some years. He was in training with his company when the war began, was moved to Winchester and then on to the Front. He was wounded in the hand, but refused to return to England, going instead to the south of France before returning to the Front. During WW2 he was in joint command of the Ashburton Home Guard with Col P Lyon, and was the Deputy Lieutenant of Devon, (exact dates unknown). In 1942 he presided over the annual meeting of the Ashburton branch of the British Legion. The Book of Ashburton (Stuart Hands and Pete Webb) Says that Major E Varwell was President of the Cricket Club, and that he gave the field to the Club - hence its name Varwell Field. Edward died on April 1st 1960 and probate was granted on the 10th August in London to William Michael Pybus solicitor and Peter Graham Heron Varwell. His effects were valued at £59953.3s.9d. 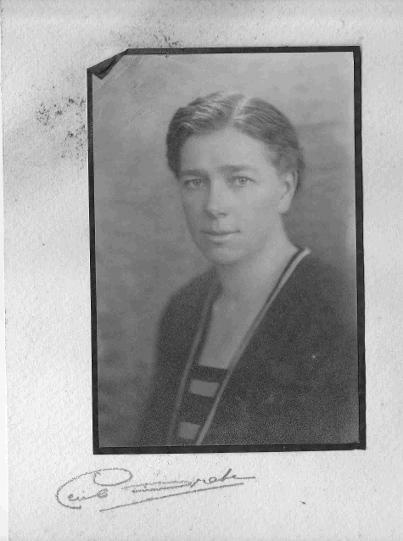 Winifred J Varwell died in the June quarter of 1963, aged 77. Her death was registered in the Exeter registration district. Above: Edward Heron Varwell, 6th from right bottom row. 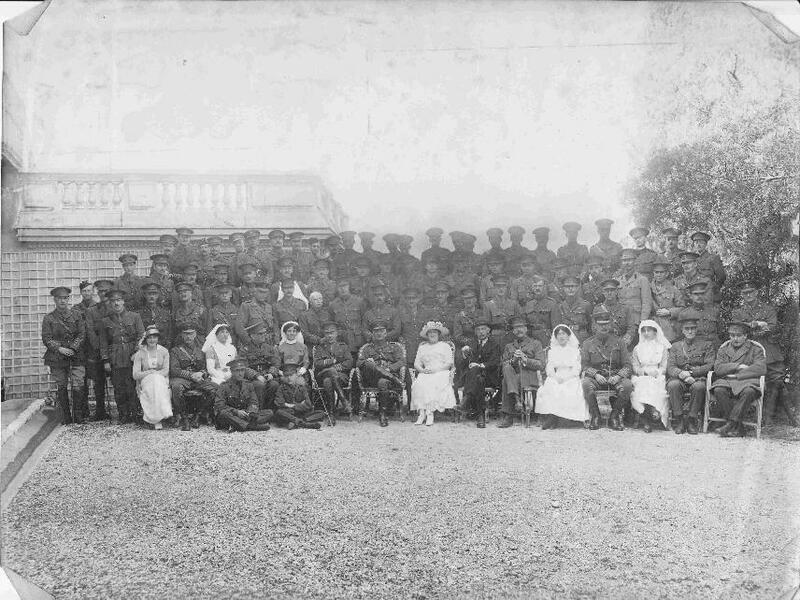 Possibly at Cliveden WW1 Hospital. The Ashburton Women’s Institute was first formed in January 1939 and Winfred Janet Varwell was one of the founder members, as was Joan Varwell. In 1947 the AWI bought the property Bank House in West Street Ashburton and Winfred Janet Varwell was one of the first and the main trustee at that time. In 1950 she became their 3rd president. Above: Part of the deed showing Edwin Tucker and Sons Ltd selling Bank House to the WI. The trustees are Winifred Janet Varwell of Place; Mary Edith Susan Sly of Mapleton, Ashburton; Alice Gertrude Batten of 14 East Street and Irene Lucy Grimes of Belgrave Nurseries. Left: The signatures of the four trustees. In 1938 Mrs Varwell of Place, Ashburton, advertised for a married couple for an 'easily worked' country house. The duties were cook-general and house-parlourman. By 1942, during the war, she was seeking held with the housework - a child was not objected to. From Edward and Winifred's granddaughter: 'I remember Place Lodge at the bottom of the drive when it was lived in by the Coles who worked for my grandparents, probably up to my grandparents' death, I think? Mr. Cole, Bert, used to look after the horses: there were generally one or two for my grandfather and my mother and sister (we lived at Newton Abbot but came over a lot) and my ponies Jane and Poppet at different times. He used to help me look after my rabbit when I took her to Place; I think he used to show rabbits when he was younger. Mr Cole also did the heaviest work in the garden. He grew incredible Sweet Williams in the garden of the Lodge and Mrs Cole, Lilly, used to help my aunt Joan in the house. There was a field behind them and another field which was an apple orchard, (both both now built over) and my pony Jane used to get drunk on the cider apples – true if weird! The fields below Place were rented out to the farmer at Place Farm just above the house. Bert and his wife moved out of the Lodge, which was a tied property when Place was sold. They had a piece of land which might have been part of Place garden and their son David aged 21 at the time built a bungalow on it for them. Later he built another bungalow next door on the same plot for his wife Joyce and himself when they got married. Right: Christmas at Place by the sitting room window 1955. 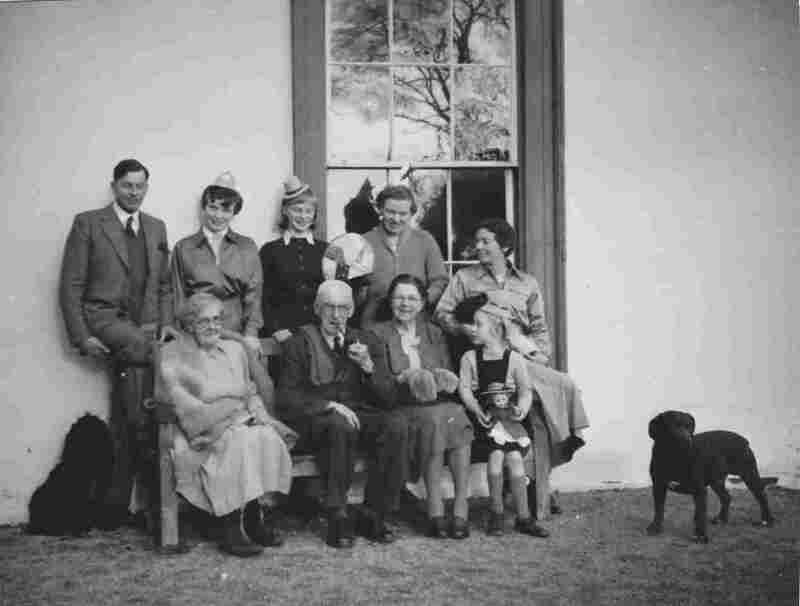 Back row: Peter Heron Varwell, Elizabeth Whitley, Clare Whitley, Primrose Vinen Heron Brett Young (nee Varwell, formerly Whitley), Joan Heron Varwell, family dogs Bragg and Jock. Primrose Vinen Heron Varwell married Peter P Whitley in the June quarter of 1938 in the Newton Abbot district. The second son of Mr and Mrs William Whitley of Welstor, Peter Whitley was described as Ashburton's youngest portreeve. From Caroline Palmer: Peter Percy Whitley farmed Sigford Farm near Ilsington until the War. He was a pilot in WW2 and was reported missing believed killed in 1942. Peter and his brother, E Neil Whitley, are on the Ashburton War Memorial, but Peter's headstone is in Buckland Churchyard. See also the WW2 Roll of honour in the Conflict section of Ashburton in Peril. 1843. The marriage was announced between Elisha Smerdon of Buckland and Miss Ann Maunder, of Place, Ashburton. In the 1851 census Thomas and Maria Maunder are farming at Place Farm, together with their adult children Thomas, William, Jane Marshall Maunder and James Marshall Maunder. Thomas Atkinson, a landed proprietor, is living at Place House. 1859 Wood Place House was up for let, and was described as having a coach house, gardener's cottage and stabling. The dining and drawing rooms were each 18 feet by 16 and there were four bedrooms with dressing rooms. In 1861 Thomas Maunder, farmer of 80 acres, is living at Wood Place Farm. He is unmarried, and living with him is his widowed mother Maria ('housekeeper'), his unmarried siblings James M and Jane M Maunder, and his niece Maria Trist. The same census shows Winifred E. Young, a widow born in the East Indies, living at Wood Place with her niece Emma E. Kitson and her cousin Anne Eales. All three women are described as fund holders. 1868. Mrs Col. Young, of Wood Place, Ashburton, donated £1. 1s to the Institution for Training Nurses. 1875 Wood Place and Place Farm were being let. 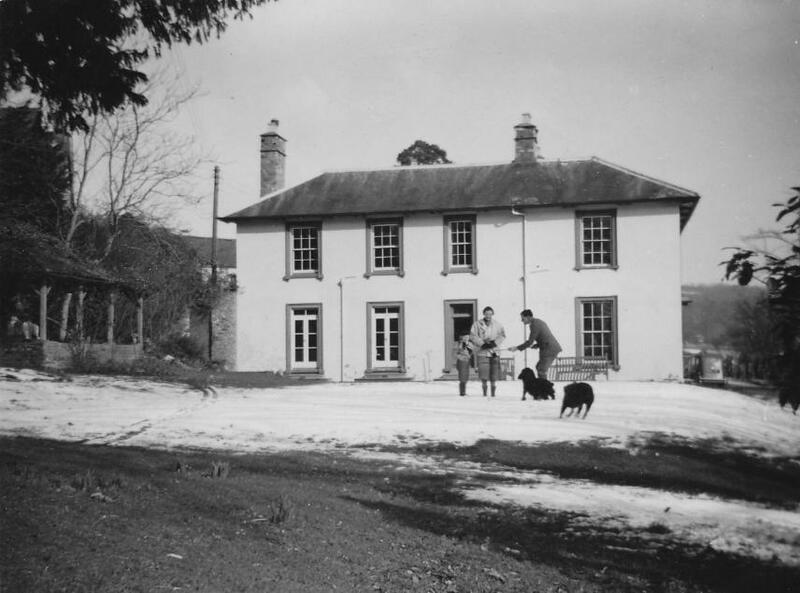 The farm, described as being occupied by Edward Kitson. had about 80 acres of land with it, and in addition a field called Balland Mead or Ford's Meadow was also to be let, as was Kiln Field or Straws-bushes. Wood Place was occupied by Mrs Young, and had been for some time. 1878. At the petty sessions Edward Samuel Jackson, 12, and Benjamin Samuel, 10, sons of a hawker on remand from Ashburton, were charged with stealing 20 apples and six pears from Mr Steele of Wood Place, Ashburton. It was not the first offence for the older boy–he was sentenced to one month's imprisonment with hard labour and then 5 years in a reformatory. The younger boy, thought to have been led on by his brother, had already spent a week in the lock-up and was released. 1885 William Seagell, aged 42, committed suicide at his home Wood Place Farm. A farm bailiff for Henry Steele J.P., he left a wife and five young children. When Middle Shutelake Farm, Cullompton was let by tender in 1888 particulars could be obtained from Henry Steele, Wood Place, Ashburton. In July 1889 Wood Place and Place Farm were put up for sale. The reserve was £4350 exclusive of timber, and as the best offer was £3000 the lot was withdrawn. 1890 Mr F H Firth of Wood Place complained to Ashburton District Highway Board about the dangerous state of Balland Lane, leading from Ashburton to his residence. The 1891 census shows Fredric H Firth living at Place House with his wife Caroline and cousin Sarah E. Firth. When Mr F H Firth sustained an accident in 1893 his residence was Wood Place, although it was Place on the list of county magistrates in 1892. Henry Steele died in June 1894 after being thrown from his horse. According to the Western Morning News he lived at Wood Place from 1872 to 1886, when he moved into the town after the death of his wife. He was chairman of the Ashburton Conservative Association, a J.P. and a keen sportsman. He had helped found the Ashburton Freemasons' Lodge. In 1897 a new railway was proposed from Heathfield Junction to Brent. The route would go through woods to Liverton, through a tunnel below the Jolly Sailor Inn and would go in front of Wood Place. A station was proposed between Headborough and Rew. When it got to Buckfast a 100 foot viaduct was proposed over the River Dart. In 1898 J Taylor of Place was seeking a situation as a coachman or groom-coachman. Frederick Hand Firth of Place, Ashburton, died in October 1903. Probate was granted to Frederick William and Henry Mallaby Firth, both of Place, and the Rev Walter Firth. The executors instructed Sawdye and Son to sell the contents of the house in February. Included in the auction was a Chippendale inlaid grandfather clock, oil paintings and water-colours by Widgery, Pike, Cook and Carter, and a 'very choice cellar of wines'. 1930. Godden, Place, Ashburton had a seven foot kitchen dresser and an old-fashioned dog grate for sale. In 1929 Stochley*, Place, Ashburton, advertised for a 'small light boy' who was able to ride, to work in the stables and garden. Later that year R Mann, Place, advertised in the Western Times for a boy (15-17) to help with the milking and 'make himself useful'. As R Mann of Place was selling a cow and calf in 1941, this suggests that (s)he was actually at Place Farm. Albert E Cole and Lily Cole are living at Sunnymeade Place at this time. An Ashburton resident remembers the Matthews family who farmed at Place Farm. She also vaguely remembers the Italian who bought Place from the Varwells but apparently they did not live there long.